The Opah: The World’s First Warm Blooded Fish? If you’ve been paying attention to the news floating around on the web lately, you may happened to stumble across several articles claiming that scientists have discovered the first warm-blooded fish- an Actinopterygii (or “ray-finned fish”) that possess the same ability as mammals to regulate its own body temperature independent from the external temperature of its environment. This discovery has the potential to blur the lines between warm and cold blooded animals more than every before, challenging an idea many school textbooks once claimed as fact: that all reptiles, fish, and amphibians are always cold-blooded, while mammals and birds are almost always warm blooded (with a very few exceptions). The fish is question is known as Lampris guttatus– the Opah. Contrary to what headlines may suggest, the Opah is not a previously unknown species that has just not been found and named; instead, it is a relatively common fish – especially around Hawaii- where it is often caught in fishing nets (although it is itself not commercially fished). Opah’s are huge fish, growing up to 6 ft (1.8 meters) long, and spend most of their time beneath 150 ft (45 meters) below the surface, though they can dive to depths of 1,300 ft (396 meters). These depths, although extreme, are not unusual amongst fish- both tuna and deep-diving sharks can dive equally far, but the Opah is nevertheless unique in how long it can remain at extreme depths, and how comparably swift and agile it is even when hundreds of feet below the surface. 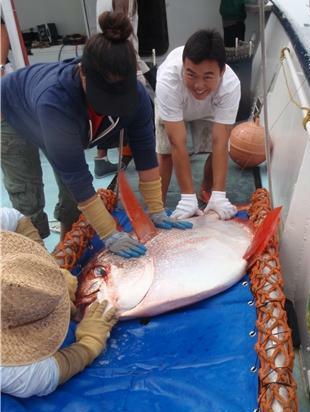 Before we get into what makes the Opah just so unique, it’s important to know two terms: endothermy and ectothermy, what we normally call warm and cold blooded. Endothermy refers to the ability for an animal to keep its own temperature elevated even when experiencing extreme changes in its external environment. Deep-diving whales, such as sperm whales, use endothermy to combat the cold of the extreme depths they hunt in, while on the surface certain arctic-dwelling mammals and birds use endothermy to stay warm and active in below freezing temperatures. Humans also have this ability- the reason we can maintain a constant internal temperature of around 98.6 degrees in both the heat of summer and in the cold of winter (barring extreme exceptions). Ectotherms- reptiles, amphibians, fish- don’t have this ability. 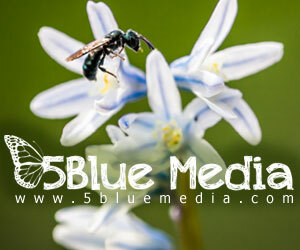 Instead, their internal temperature directly correlates with their external environment. This is why fish close to the warmer waters of the surface are often faster and more active, while fish that stay at deeper, colder depths are often slower, more sluggish, their bodies not able to expend the same kind of energy as their warmer-water cousins. Yet, as with many things in science, there are certain gray areas that blur the lines between these two black-and-white extremes. Some fish, like the above mentioned sharks and tuna, have an ability called “regional endothermy”. Although their bodies by and large still rely on their external environment, when diving to colder waters they can warm their blood to certain external organs and muscles- usually the eyes (to better track prey), liver, and swimming muscles. This allows these fish to still hunt at waters they would otherwise not be able to survive in, though it comes with one flaw: it cannot warm the fish’s heart. As a result, fish with regional endothermy are still sluggish in cold waters, and must return to warmer waters every so often to prevent their hearts from failing due to the cold. The Opah, meanwhile, has a remarkable advantage over its fellow deep-diving fish. It possesses an adaptation called “counter-current heat exchange” (see the video from The Guardian below), in which the blood vessels in the tissues of its gills are set up in a way so that vessels carrying cool, oxygenated blood from the gills to the body are in contact with blood vessels carrying warmer, deoxygenated blood from the fish’s body to its gills. As a result, the outgoing blood warms the colder blood coming in from the gills, ultimately resulting in a heart that doesn’t grow cold even when the fish is swimming in the extreme temperatures of the ocean’s depths. All told, this allows for a fish that is a faster swimmer, has better vision and possesses quicker response time that any other fish in the deep ocean, whether that be its deep-sea prey or fellow deep-diving competitors. And because the Opah doesn’t need to worry about its heart failing from the cold, it can stay at depths for far longer than any other fish, another incredible advantage for a deep-diving predator. But is the Opah really “warm-blooded”, as you and I are? For all of the Opah’s evolutionary advantages, though, many scientists are stopping short of claiming that it has “full-body endothermy”- that is, that it is completely warm blooded. For one, although the Opah’s body temperature is always about 9 degrees Fahrenheit (5 degrees Celsius) than the water around it, its internal temperature does still lower the further it dives. In addition, temperature profiles of the Opah show that the warmest part of it body are its core, including the areas around the eyes and heart, while the external edges of the fish are colder- something you wouldn’t see in, say, a truly warm-blooded whale. Because of this, some are claiming that the Opah- what is now being called the “first warm blooded fish”, may not possess complete endothermy at all, but rather just better regional endothermy than any other fish to date. 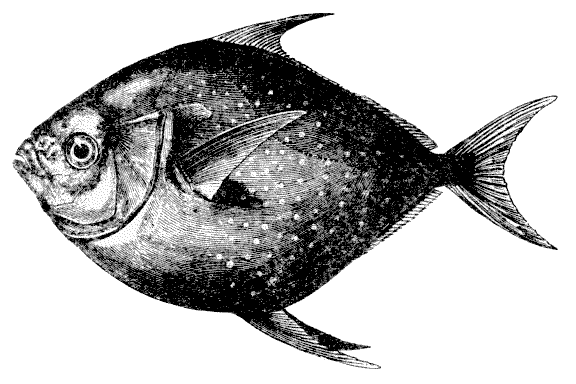 Other scientists still state that the distinctions between “warm-blooded” and “cold-blooded” are archaic, and that many animals- the Opah, tuna, deep-diving sharks included- instead occupy a gray area between endothermy and exothermy, and shouldn’t be consider entirely beholden to one category or another. Regardless, the abilities of the Opah are remarkable among fish, and no matter whether it is fully warm-blooded or ony partly so, it stands as an example of the incredible adaptations that can result from evolution. Wegner, Nicholas C., et al. “Whole-body endothermy in a mesopelagic fish, the opah, Lampris guttatus.” Science 348.6236 (2015): 786-789. Opah (Lampris guttatus), family Lampridae. From Günther, A.C.L.G., 1880. An introduction to the study of fishes. Today & Tomorrow’s Book Agency, New Delhi. Devin Windelspecht is a sophomore at Northeastern University in Boston MA where he majors in international relations. What Does NCA4 Mean For Our Everyday Lives? What Happens to Your Body When You Scuba Dive?